In this edition of Kids' Maximum Shelf--the monthly Shelf Awareness feature that focuses on an upcoming title that we love and believe will be a great handselling opportunity for booksellers everywhere--we present How Rocket Learned to Read by Tad Hills, which goes on sale as a hardcover picturebook and e-book simultaneously on July 27, 2010. 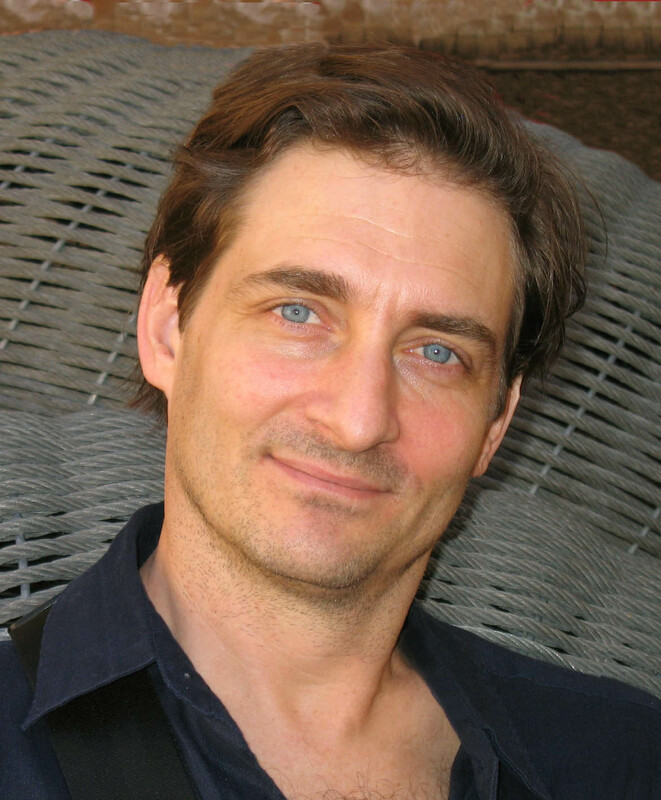 The review and interviews are by Jennifer M. Brown. Random House Children's Books (of which Schwartz & Wade is an imprint) has helped support the issue. Raised in the Massachusetts countryside by a mother who taught at the Audubon Society and a father who was one of a long line of engineers, Tad Hills honed his powers of observation and capacity to build things. 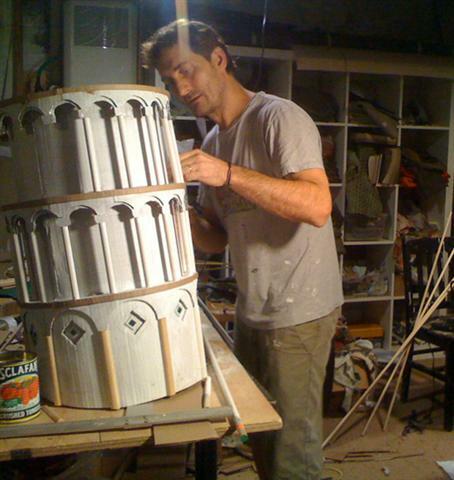 "I really like to make stuff, it's in my blood," he says. "Everything I make I approach in the same way, whether it's a story, an illustration or even something three-dimensional." 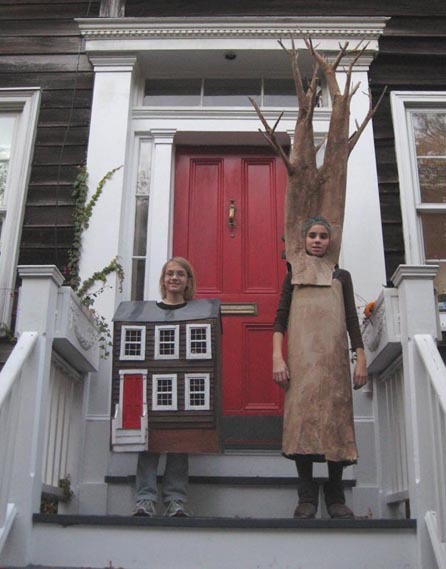 He makes his children's Halloween costumes (he and his wife, Lee Wade, have two children: Elinor, now 14, and Charlie, 11) and cites that as an apt example: "I start with nothing and put pieces together and figure out how to make them stand up." 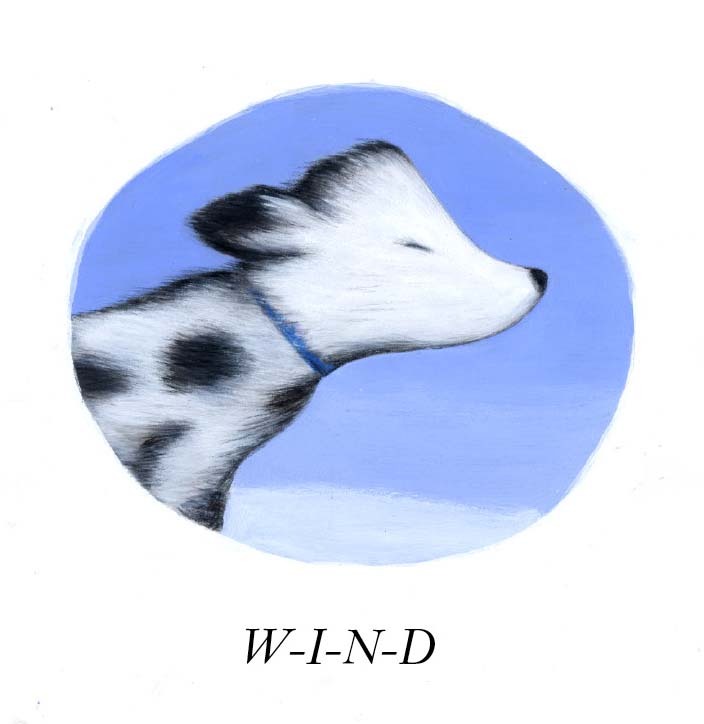 The same could be said of Hills's latest hero, a dog named Rocket who starts with nothing (not even an interest in reading) and begins to put letters together into meaningful words. How did you get started in children's books? I was a studio art major at Skidmore. After college, I moved to Brooklyn and worked on my art. I had various freelance jobs, including doing book jackets for Lee, my future wife. It was before we started going out. Lee went to Skidmore with my sister, and I went there with her brother. I did the illustrations and she designed book jackets when she was at Henry Holt and Macmillan. Around the time she and I got married, she moved into children's books. She and Anne [Schwartz] said I should try to write a picture book. So I wrote Duck & Goose. It was the first book that Lee and Anne published at Schwartz & Wade. Where did the idea for Duck & Goose come from? I'd been kicking around a title in my head: The Silly Goose, the Odd Duck, and the Good Egg. As I was writing the story, I realized the egg had to be big enough for Duck and Goose to sit on. In the end it would have to hatch, and it would have to be a dinosaur or dragon or ostrich egg--something gigantic. And that wasn't the kind of story I wanted to write. It took me two months and many, many drafts to figure out that the egg should be a ball. What was the seed for How Rocket Learned to Read? Well, we got a little Wheaten Terrier puppy and named him Rocket. He's an unbelievably great dog. Lee and I both knew he would inspire a story. After creating a cover featuring a tiny bird reading a book to a dog for the PW spring 2008 children's announcement issue, the Rocket book idea came to life. What I wanted to do was come up with a story that would get kids excited about learning to read. 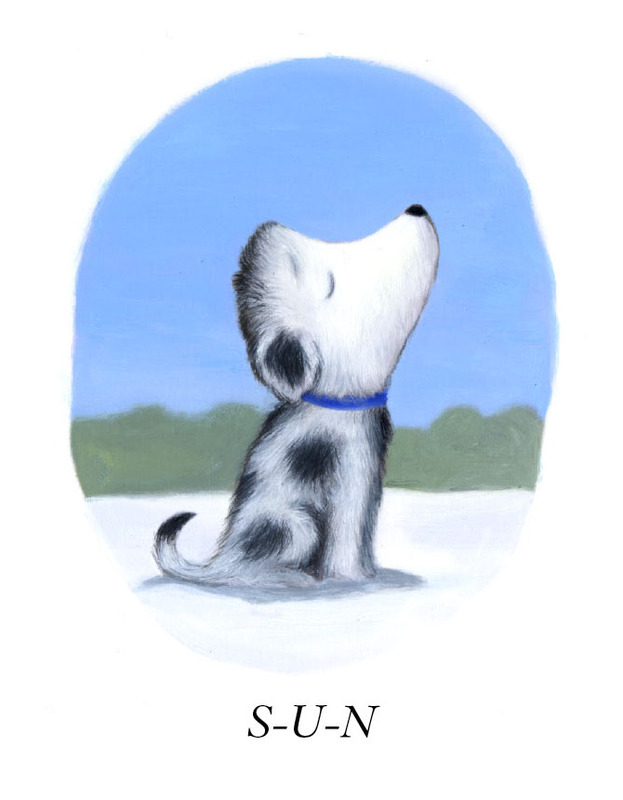 It felt like there was a need for this kind of picture book. When I went to the library to find picture books about learning to read, I was surprised not to find any. Also, I'm a big believer in reading to your kids, so I knew I wanted a teacher who appreciated the importance of reading out loud. Was it difficult to come up with that beginning sequence, where we watch Rocket's resistance to the little yellow bird, and we see him gradually come around? It's so important for setting the tone of their relationship. Well, I knew that I wanted to establish Rocket as a reluctant reader who is drawn in by a compelling story. I also worked hard on creating the visual setting for the story. I built a little model out of cardboard, with fences and trees that I could move around. I was trying to figure out from what angle to draw the scenes. It was complicated, but eventually I worked it out. We loved that only Rocket's tail is visible as the little yellow bird hangs up her banner, and also when she begins reading. It's kind of a motif for all of my books. In Duck & Goose you see the blue bird's tail when they think the egg is hatching. You see just the feather in the back, and also in Duck, Duck, Goose, you see Goose's little feet sticking out on the other side of the bush, when Duck is looking for him. The dogs here are free to roam, which you don't find much anymore. 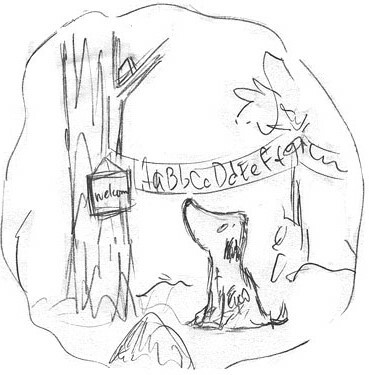 My childhood dog roamed free--the Gulliver in the dedication. Everyone on my street knew to slow down because he'd be asleep in the middle of the road. In Duck & Goose, except for the ball, there's no reference to our world. No one has ever asked me where the ball came from. I've read Rocket to a bunch of kids, and no one has said, "Where does Rocket live?" 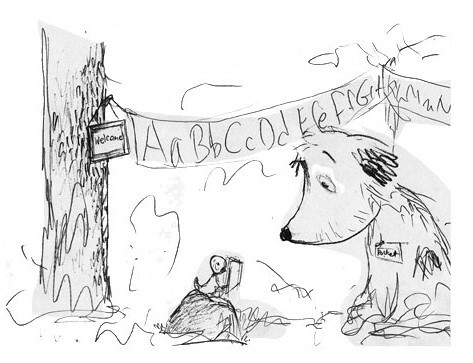 How did you approach the illustrations for How Rocket Learned to Read? Since I wanted the book to mirror a school year, the colors were important. The story starts in the fall as the leaves are changing and goes through the snowy winter and ends in spring. When I'm first starting work on a book, I do lots of sketches and then scan them into the computer and move them around to compose the image. I use the computer the way I was using the cardboard trees to get that beginning sequence. I can make them bigger, tweak them here and there. I'll throw in some color to get a sense of generally what color they'll be. The finished work is water-soluble oil paint on paper. It's great stuff because you can treat it like oil but, where you'd use solvent or linseed oil, you can use water to thin it down. I do a lot of my painting at the kitchen counter when everyone's around. I put my pictures up on the dining room walls. I can do it because there aren't a lot of smelly solvents around. It's allowed me to work in the house and around my kids. It takes days to dry. When the illustrations dry, I'll go in with colored pencils or more paint, whatever needs more definition. Because you work at home, does your work life spill over into your family life? I do get a lot of ideas just living in this house with my family and with the dog. For example, the other day I was vacuuming and I was thinking of how terrifying a vacuum cleaner would be for a mouse living under the floorboards. He'd nearly get sucked through the cracks between the boards every time the vacuum went by over his head. I might use that in my next story. The thing is to remember the ideas and try to work them in. Because there are one million ideas every day. There's so much stuff when you have kids and a family. It's hard because I tend to procrastinate a lot, but at the same time I'm always thinking about what I'm doing. When I'm walking the dog, I'm working. Lee has deadlines, too, so she might come home and expect to see something. She'll say, "How did it go today?" Sometimes the sum total of my day is one good sentence. How do you work with Anne and Lee? Lee is my blue bird (the voice of reason from Duck & Goose). She helps me focus on what I'm trying to say. I'll talk about a scene with her, and she'll give me encouragement. She helps me tighten it up, and then I'll send it to Anne. They're both involved in the editing process for me. Whenever I do a dummy, they both have plenty of ideas. In terms of design, that's Lee's thing. way. How did you do that? I wanted to start with basic noises to help open up kids' ears to the many sounds around them. I think it's really fun to hear sounds and try to attach letters to them like wooooosh and grrrrrr. Those sounds lead to understanding how other words can be built one letter at a time. In one spread, I used one-syllable sight words like D-I-G, W-I-N-D and C-O-L-D with visual clues in the artwork so that emerging readers would have all they needed to read them. I love seeing kids' faces when they figure out what the words are. And kids are so tuned in and attentive; they don't miss a beat. They see “S-U-N” and “M-E-L-T” and they say, "That means spring is coming!" On the last page, every kid reads A-G-A-I-N letter by letter. In an effort to firmly establish this winsome pup alongside his feathered forerunners Duck & Goose, Random House is planning a five-city national author tour for Tad Hills: Chicago; Seattle, Wash.; San Francisco; Lexington, Ky.; and Portland, Ore., where the author-artist will also participate in the Wordstock Festival (October 9-10, 2010). Hills will also do local bookstore appearances in his home town, Brooklyn, N.Y. How Rocket Learned to Read was featured at the International Reading Association and the American Library Association's annual conference in Washington, D.C.
A direct marketing campaign orchestrated by Mediacy will include the distribution of easels that come with "I Can Read Like Rocket!" stickers. The Mediacy campaign, which extends from August 15 to September 15, 2010, will target bookstores, pediatricians' offices, and Gymborees and other children's clothing stores in 10 cities: New York, Los Angeles, Chicago, San Francisco, Boston, Washington, D.C., Atlanta, Philadelphia, Dallas and Detroit. For bookstores, Random House has created a six-copy counter display, as well as "I Can Read Like Rocket" stickers and activities posters for bookstores and libraries. 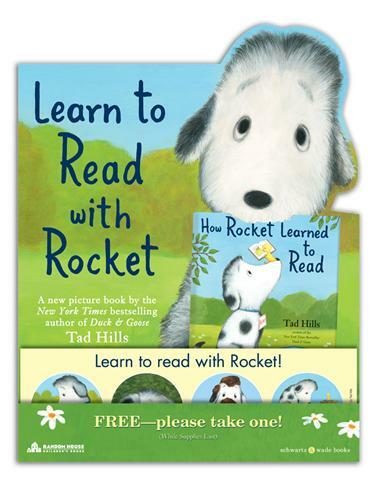 How Rocket Learned to Read will also be highlighted in the publisher's Summer 2010 Storytime Kit. 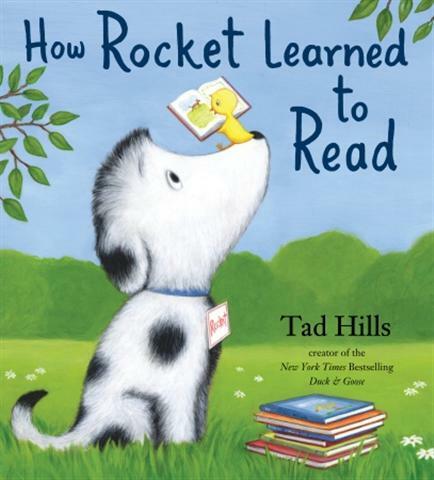 A new video features children demonstrating their newfound skills by reading and sharing their love for How Rocket Learned to Read. The real Rocket--the dog that inspired the book--makes a cameo appearance! How Rocket Learned to Read will have its own website and will be featured on the Duck & Goose minisite and in the banner on the Kids@Random home page, as well as on the Librarians@Random and the Teachers@Random sites. How Rocket Learned to Read will also be the lead title in the "Take Time Out to Read" online advertising campaign on Scholastic.com. Let's get everyone reading with Rocket! William Steig, John Steinbeck, Harper Lee, Kurt Vonnegut, Thomas Pynchon. 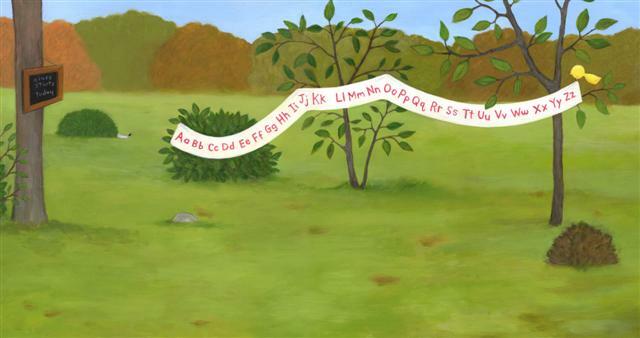 It is rare to find an author who can move seamlessly from books aimed at toddlers to stories for children just beginning to unlock the mysteries of how letters form words. Tad Hills, who flew onto the picture book scene with his winning Duck & Goose, here proves that he numbers among that elite group. 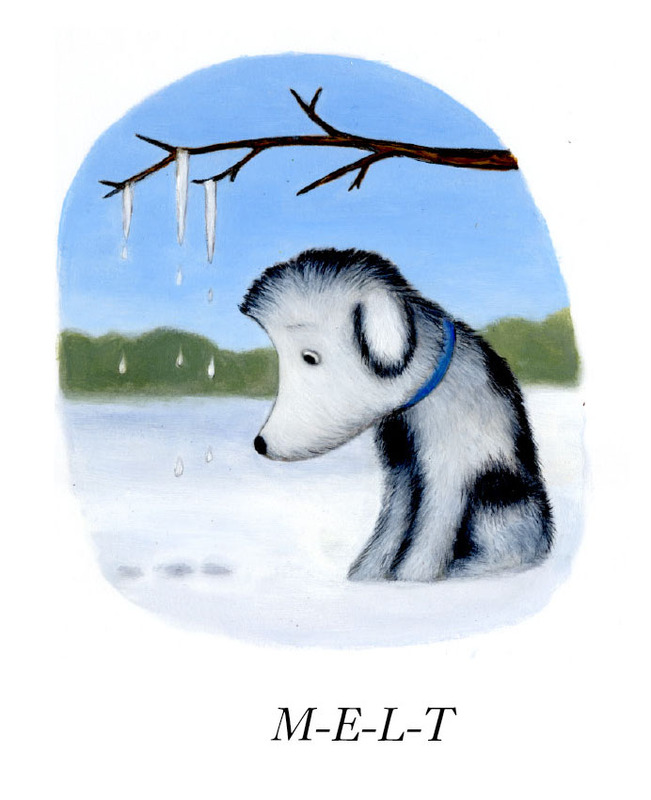 Through a series of deceptively simple words and images rendered in oil and colored pencil, Hills tells a multilayered story about learning to read and making a friend. A shift in his palette conveys the passage of time, and the changes in the puppy hero's expressions and body language convey the furry pupil's gradual openness to his little feathered teacher's patient and persistent overtures. 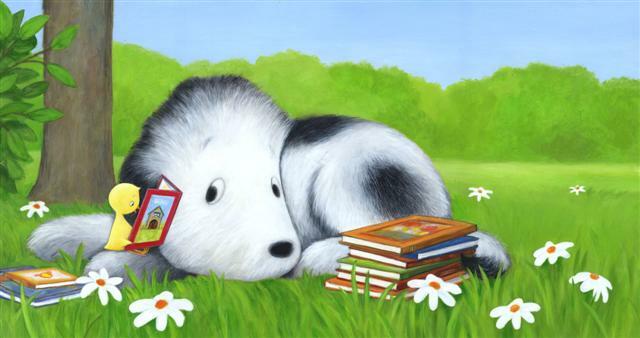 On the title page, a black-and-white pup pleads with his eyes for you to read him the book he has fetched (the very same How Rocket Learned to Read). 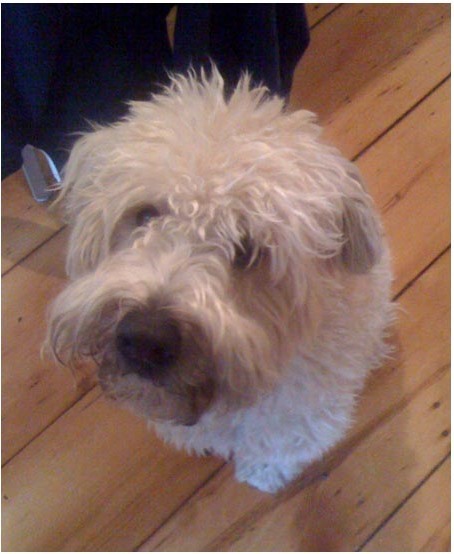 First off, we meet Rocket, a dog who loves to play: "He loved to chase leaves and chew sticks. He loved to listen to the birds sing." One day, after a full morning of play, just when he's "settl[ing] in for a good nap," a little yellow bird alights on Rocket's tufted forehead. "Aha! My first student! Wonderful!" she sings. Rocket responds by moving on to a new napping place. The sequence of images that follow subtly yet brilliantly convey the bird's stamina: a full-bleed spread shows her mounting a banner of the alphabet (in both upper- and lower-case letters), while only Rocket's tail pokes out from behind a faraway bush. 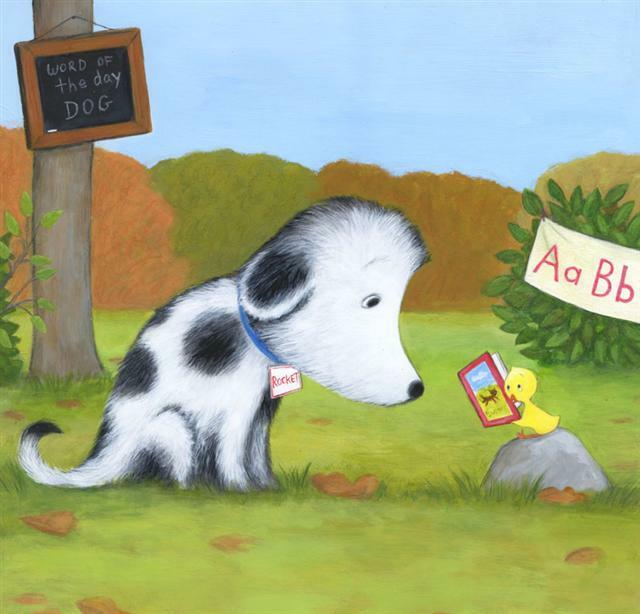 Her task completed, the bird perches on a tree branch in a full-bleed, full-page illustration, and begins the story of an unlucky dog, Buster, who has lost his favorite bone. Again, we see just the tip of Rocket's tail. Opposite, a vignette that creates the feeling of looking through a telescope zeroes in on Rocket behind a bush, the "teacher" barely visible in a treetop branch, obscured behind a book as large as she is. "At first Rocket was disturbed," and his expression shows it. But as Buster's story progresses, a series of vignettes depicts Rocket perking up. The little yellow bird flies off, leaving her furry listener with a cliff-hanger.